Our kennels began with our involvement with livestock guardian dogs over twenty years ago - predominantly Great Pyrenees at the time. Our dogs watched carefully over our ranch animals goats, sheep, exotic birds and even the horses. Currently still raising Great Pyrenees our kennels are also home to the magnificent Spanish giant - the Pyrenean Mastiff. Our kennels of Tierra Alta were the first importers and breeders of the Pyrenean Mastiff in the USA. All of our Foundation stock has been imported from its country of origin Spain. In addition we also have the first imports from Finland and Czech Republic and now our own American bred offspring. All our dogs are from the finest stock available today. Our dogs are very important to us and receive no less than the best we can provide them. Some years after the arrival of our Pyrenean Mastiffs came our first pair of Spanish Mastiffs - Espartaco and Florinda de Jusiante direct from their home country of Spain. We selected them for their type as they had the traits that we hoped to perpetuate in our breed as it grew in the U.S.A. Those traits being a dog of immense size but with a sweet expression and a dog that was always watchful and alert but intelligent enough to remain calm unless there would be a need to be otherwise. In the next years to follow up to present day - Espartaco and Florinda have been joined by many of our other wonderful mastines which came to us from both Spain and Czech Republic. They all have different attributes and excellent pedigrees but most of all they are all very special to us and are a big part of the family. 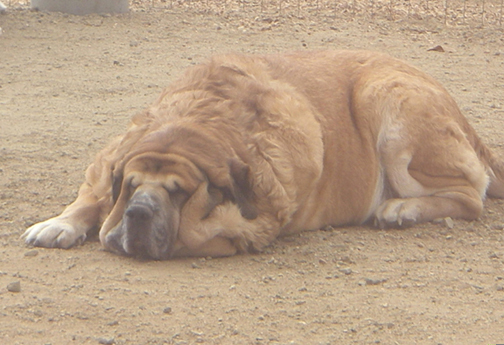 Tierra Alta Pyrenean and Spanish Mastiffs are registered F.C.I. At our kennels our dogs are raised in family groups and are well socialized from puppyhood. With the arrival of our Pyrenean Mastiffs the additional kennel name " Tierra Alta" was founded to represent both breeds in the U.S.A. Since the arrival of our mastines the breed has prospered with the interest of a few breeder enthusiasts - however it is still rare in this country in comparison to many other molosser breeds. The Spanish Mastiff was bred to protect his flock and his territory - not trained to do so. It is this instinct that the breed still carries with it today. This great guardian is highly intelligent, trustworthy with those it knows and respects, is easily trainable and gentle with children and the creatures it is to protect. Interest in the breed has continued to grow as many come to encounter the breed and fall in love with it just as we did.